Parental alienation does occur (I have no idea whether this mother is guilty of it or not), but this judge has it wrong. Our courts cannot enforce an order to have “a healthy relationship” with anyone else. All a court can do is to force contact. It cannot make the contact – or relationship – a positive one. MR.________: Okay, so I — I do apologize if I — I didn’t understand that the rules of the — like the — with — with — like apologize to whatever I did to you, but I do not apologize for — for not talking to him because I have a reason for that and that’s because he’s violent and he — I saw him hit my mom and I’m not gonna talk to him. If this boy did, in fact, see the father hit his mother, not talking to him may very well be an appropriate reaction. THE COURT: I’ve never seen anything like this. One day you can watch this video and realize that …you two have been brainwashed. Your dad is a good man. Your dad is a good man who loves you. You have been brainwashed. You are brainwashed. This is not normal behavior. Only — no adult in this courtroom, except one, thinks this is normal. Every single adult in this courtroom thinks you have been brainwashed. Your dad is a good man. And wipe that smirk off your face. Telling a child that s/he has been brainwashed is troubling. The child’s reaction is not “Oh, gee, I better get un-brainwashed.” It is more likely that the child will find the accusation to be demeaning and a challenge. 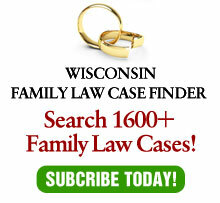 Wisconsin does not have a specific age when children can choose between parents (other than the age of majority). We also do not allow children to have advocacy counsel. Most GALs do a good job of differentiating between those children too young to make these decisions and those who are old enough to make them – the best example being a 16 year old with a driver’s license and access to a car. In the latter event, in my experience, the child ends up getting his or her way, whether that is healthy or not. Forcing a teenage to see a parent whom the child does not want to see does no favors for either the child or the parent. In these rare cases, the child makes the visit so unpleasant that the parent eventually gives up. The problem with forced placement is that it focuses on the rights of the parent, rather than the best interests of the child. If the child is doing perfectly well with Mom – going to school, getting decent grades, etc. – why is putting the child in detention is his or her best interest? Again, while I am unaware of all of the circumstances involved in this case, it is very troubling and highly unlikely to help anyone, including the parent.